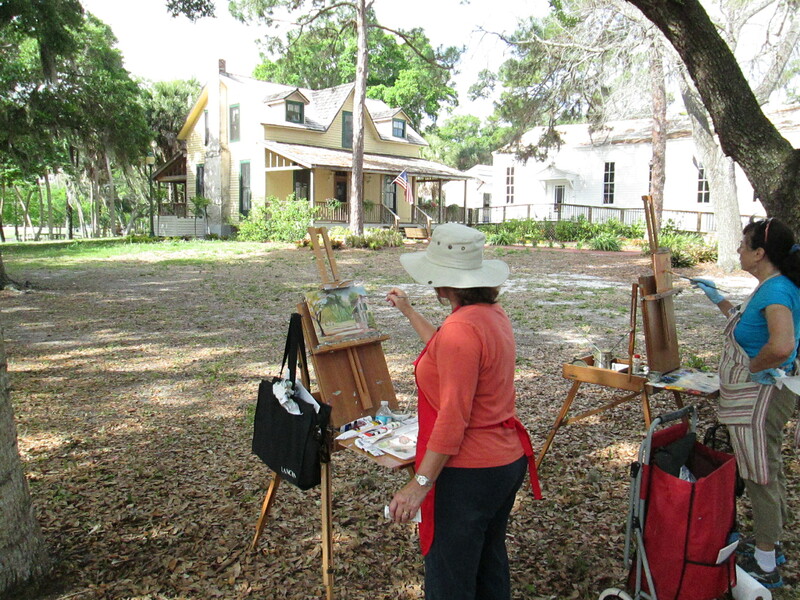 The Historical Society of Sarasota County has lots of events to choose from for the New Year. Mark your calendars and join us often! Always a sell out, this year’s High Tea in the beautiful and historic Crocker Memorial Church features several nationally known local artists, members of our “Light Chasers” who will exhibit their works and sell “Off the Easel” works that they will paint while guests are having a High Tea inside the Crocker Memorial Church from 2p – 4p on Sunday January 11. Live music will be provided by Sal Garcia. The theme for this year’s event is “Tea and Flowers.” Wear your prettiest “tea” hat and enjoy a cordial event! Guests will receive flower cards provided by our wonderful hostess Judy Alexander. Refreshments provided by Morton’s Market and The Breakfast House. Tickets are $25 and reservations are a must. Call HSoSC at 941-364-9076 M-F 10a to 2p to charge your tickets, or email us at hsosc1@gmail.com for further information. All monies raised go for the maintenance and upkeep of the gems of Pioneer Park, the Bidwell-Wood House (1882) and the Crocker Memorial Church (1901). Our renowned Conversation series continues at 7pm on Tuesday January 13 in the Crocker Memorial Church with our January meeting featuring David Duncan with a conversation about “Wisconsin Pullman,” John Ringling’s Railroad Car. Come learn, come join the conversation! These meetings are at 7pm and are free to members and $10 for guests. New Feature! Beginning in January, HSOSC is starting a History Book Club headed up by president Howard Rosenthal and member Anita Palladino. We’ll discuss a local history classic, “Sarasota A History” by Jeff LaHurd. These meetings will take place on the 3rd Thursday of the month at 1pm from January thru April in the Crocker Memorial Church. Learn more. The series continues in January with Charles Sobczak, author if our favorite guide book “The Living Gulf Coast – A Nature Guide to Southwest Florida” Mr. Sobczak has been a featured lecturer with Road Scholars. His first novel, “Six Mornings on Sanibel” is currently in its seventh printing. His lectures are memorable for their relevance and his sense of humor. You will be able to purchase and have autographed The Living Gulf Coast at the event. This event meets in the Crocker Memorial Church at 11:30am. Bring your lunch to enjoy on the back porch of the Bidwell-Wood House. Beverages will be provided by HSOSC. Free for members and $5 at the door for guests (reservations not necessary). Learn more. Sue Blue narrates a two hour tour of downtown historical sites. Trolley departs from and returns to the Crocker Memorial Church on Saturday January 24 from 10a – noon. Reservations are required and tickets are $25. Call HSoSC at 941-364-9076 M-F 10 to 2 to charge your tickets, or email us at hsosc1@gmail.com for further information. Learn more. This entry was posted in History Fun, Participate. Bookmark the permalink.